As you may know, my rippled validator runs on GCE. So I use stackdriver to monitor it. I created two custom metrics for it. 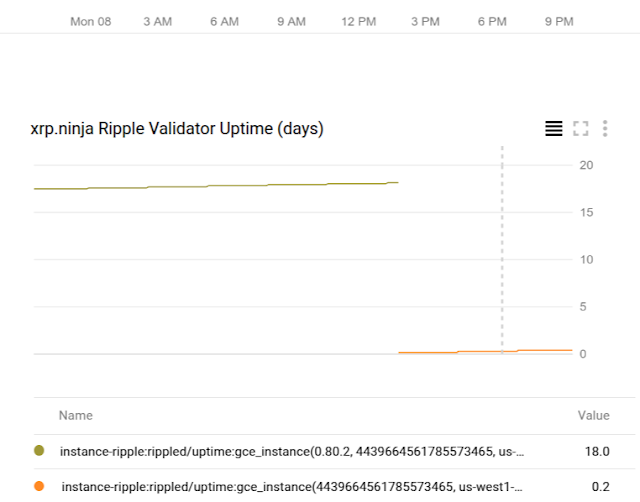 One metric is uptime with rippled version as a label. Here's a live graph for this metric. From this graph, you can easily tell what the current version is and when it was upgraded to that version. You can also correlate this with other graphs to see if new version may have caused certain changes in rippled behavior. The other metric is the percentage of current uptime that rippled has been in a certain state. Normally the curve for "full" state should asymptotically approach 100. If it is not, then rippled is in trouble.